With more than a half a dozen books published and more on the way, Shannon K. Butcher has split her time between writing action-laden romantic suspense and her new paranormal romance series, The Sentinel Wars. Congratulations to "Colleen C.", the winner in Shannon's giveaway. Thank you for participating in the giveaway. 1. You deal with some intense plots. Do you have days where you are so drawn into your world that you need to talk yourself down at the end of the day? 2. 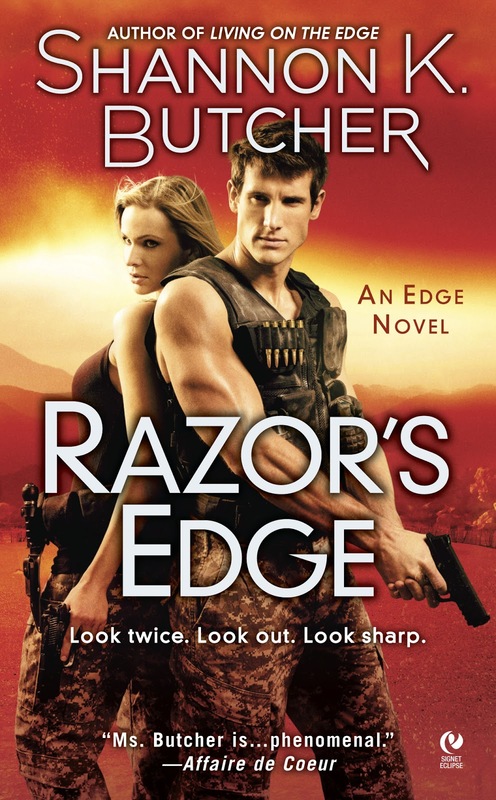 Was there an inspiration for the "Edge" series? I can’t really pin down a single inspiration, but I think both Alias and Fringe were ingredients in my brain soup. While I didn’t want the suspense series to go so far over the edge of reality that it started blurring into paranormal, I do enjoy the more fantastic elements of science, and didn’t mind taking liberties on that front. The goal was to walk a fine line, leaving the reader with a feeling of it could happen when they read the stories. 3. I am a big fan of authors. But I am also a fan of engineers. Do you ever tap into that industry when you are writing? Yes, I do pull from my training and experiences as an engineer to help with things like combat physics, setting details and story ideas. While my engineering degree has often been helpful, I have to admit that when I first started writing, I had the grammar of an engineer, which wasn’t at all helpful. Sadly, most days I still spell like an engineer. 4. The jewelry you design is beautiful. How did you get into that? Thank you! I’ve been a beader and a crafty person for years—since I was a kid, really. I started the way most beaders do: putting beads on a string. 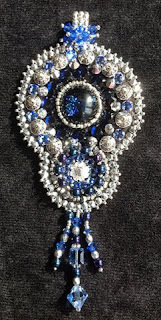 From there I moved to more complex beading patterns that form structural patterns. After that I found bead embroidery and fell in love. There’s so much one can do with a needle and thread, and it always looks way more complicated than it really is. When I’m not writing, you can usually find me in my craft room, wading through a pile of beads. 4. What can we look for next? Because we can't wait! Aww. You’re too sweet! Next is book seven of my paranormal romance series, the Sentinel Wars. FALLING BLIND, which comes out the first week of April, focuses on the Theronai warrior Cain and Rory, who is plagued with a curse she can’t shake. I’m currently working on my contribution to an anthology entitled KICKING IT, which features a ton of fantastic authors writing both urban fantasy and paranormal romance stories just for you. In addition to that, I have a few other projects up my sleeve that I’m not yet ready to talk about. But I can share that there are several new worlds and characters coming to life in my head, and I can’t wait to share them with you! Shannon will be giving away a signed copy of RAZOR'S EDGE as well as this beautiful necklace to one really lucky winner! Giveaway ends 11:59pm EST Dec. 2nd. Please supply your email in the post. You may use spaces or full text for security. (ex. jsmith at gmail dot com) If you do not wish to supply your email, or have trouble posting, please email maureen@justromanticsuspense.com with a subject title of JRS GIVEAWAY to be entered in the current giveaway. Hi Shannon - talk about talented! Engineer, writer, and you can make jewelry? Holy cow, I am jealous! I haven't read any of your books yet, but the covers alone above will move me to go check out your books. Which book of yours is best to start out with? I love meeting new authors here! I have seen these books but haven't purchased yet, would love to try one!!! I have made jewelry too, but just simple things with beads... you are very talented! Thank you so much for sharing with us today Shannon! 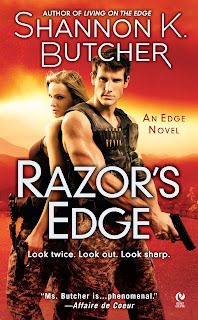 I haven't read any of Shannon's books lately and it sure sounds like I need to start with the Edge series - partial to romantic suspense. The necklace is absolutely beautiful; I can't imagine the patience required to craft something so lovely. Thanks for the chance to win. Congrats on the upcoming release, Shannon. Really looking forward to "Edge of Sanity." I've not read your books before but this series looks awesome! I love the suspense and real science mingled together with romance. And I would love to wear the necklace. The beading design is beautiful. You are so talented. Congrats on the new release and thanks for thinking of your readers with this contest. I love the sound of your world-building. I don't mind you taking liberties with the science. It makes it exciting and unique. I like to get lost in a world and it sounds like I will in yours. You have a lot of talent Shannon. The necklace is beautiful. Please enter me in your draw. Shannon, I was wondering when is the next book in the Sentinel War. You have answered my thoughts. For an engineer, you sure have a creative side. Thanks for writing these wonderful books. Gorgeous necklace!! I love, love your books and can't wait to read more of them. Thanks for the chance. 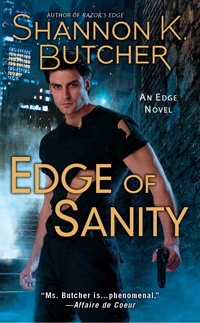 December 4 can't come soon enough - can't wait to read Edge of Sanity! You certainly are creative. I've made a few little things with beads, but nothing as intricate as your work. Loved the interview. Want to read this book and series. Thanks for the giveaway. Great interview & Beautiful necklace. When talent was passed out you were blessed! Thank you for stopping in and letting me get to know you a bit. I love rom/sus books and paranormal just as much (if not a bit more). Your jewelry is beautiful! Thank you for offering this giveaway. oh yeah... elizabeth dot cole at elizabethcolebooks dot com. thanks! I сοuld nοt гefrain from commenting.